Broadcast on Channel 5 (UK) 07 May 1997 Wed 4:40 a.m.
Greg, Steve and Karen do not appear in this episode. The police wonder what to do, until Col shows them his hostage at riflepoint at the window. Noeline scoffs at two women who are drinking grog in the laundry saying that her own home brew used to "leave you crook for days". The women refuse to give Lizzie a drink of the stuff she made, so she goes to Monica to complain. Clara decides to ask Erica if she can throw a party for her birthday. 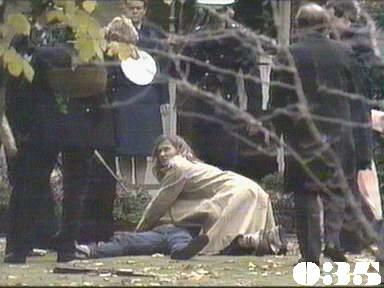 Mrs Woods tries to calm Col down, but points out he can't expect to just walk away after shooting at the police. Senior police officers arrive at the scene just ahead of Mr Woods, who is shocked to see his wife held at gunpoint. Clara offers a cookery lesson for her birthday treat to the other women: she hands over a shopping list to Erica who draws the line at wine, but allows the request for yeast. The police ask Col what his demands are: he can't think of anything better than to tell them to go away. Mrs Woods remembers who Col is and, getting impatient at the lack of action, grabs the megaphone and talks to Col. All he achieves is to get himself shot in the arm. Lizzie uses the yeast to make an extra brew in a store cupboard. Noeline unfortunately catches them at it and demands to be given half. Col demands to see Noeline, but the police say they will have to think about it. Erica attends Clara's party but Noeline leaves before the soup course and goes to drink the booze in the store cupboard. Meg calls Erica away from the party to get Noeline, who is found dead drunk on a folding table in the laundry. Yvonne has a few friends round while her parents are away for the weekend. Bea hears the noisy music at three in the morning and plays the heavy mother by breaking the party up. Noeline is taken to the scene of the siege next morning, but somehow she is still drunk and has to be propped up against the car while the police decide what to you. Vera volunteers to takes Noeline inside the house to see Col. Noeline is contemptuous of Col and says she can't be any help, reminding him that she told him not to take his gun. Possibly nauseated by Col's drivelling incompetence, Noeline chunders in a plant pot, and Vera and Mrs Woods make a run for it. Noeline leaves the house and Col follows her. He is shot and killed by the police . Noeline blames Erica for bringing her to the siege, or Col would still be alive. Bea goes next door and finds Yvonne still sitting in the mess from the party. When Bea leaves, Yvonne has a fit of spitefulness and picks up the phone to call the police to get back at Bea. More pitiful acting: the performances of Col, Mr Woods and Inspector Horne are just embarassing.